The dates and locations for our 2019 trail building & maintenance trips have been set. 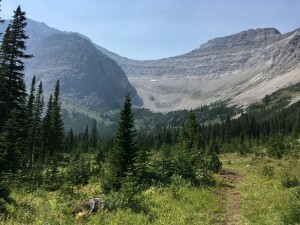 This year, we will be holding 8 trail building trips on the new High Rock Trail in the Livingstone PLUZ (near Crowsnest Pass) in June and July, continuing construction of the first new section of the GDT in 30+ years. 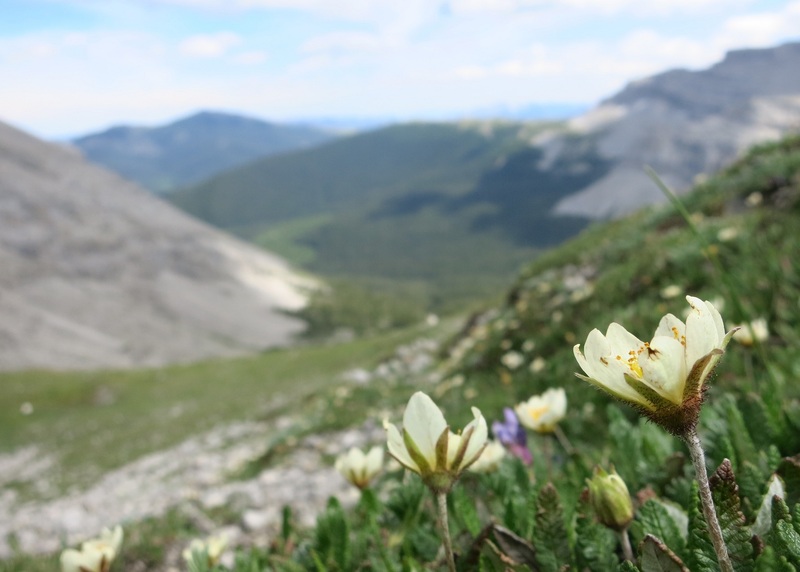 We will also be holding 3 additional trips on the original section of the GDT near Lost Creek, Maligne Pass Trail in Jasper National Park, and David Thompson Heritage Trail in August and September. If you are a resident of the Crowsnest Pass area, we have also created an opportunity for daily “drop-ins” on Trips #6 & 7 for more flexibility. Our trips are generously supported by our awesome premium sponsors MEC, North Face, and Teck. Please note that due to circumstances that are sometimes beyond our control, trip types, dates, and locations are always subject to change. We will inform you as soon as we possibly can in the event of such change. BASIC CAMP SET-UP: Kitchen shelter, fire pit & latrine. FOOD: Volunteers will bring & cook their own food. TRANSPORTATION: Carpooling will be organized by the GDTA, gas included. REQUIREMENTS: Trail building experience is not required, but volunteers should have some experience backcountry camping and hiking. COST: Free for GDTA Members. ENHANCED CAMP SET-UP: Camp kitchen (including stoves and BBQ), fire pit, solar shower & latrine. FOOD: All food is included, prepared by our head chef and a team of assistants (all volunteers take turns helping out in the kitchen). COST: $100 for GDTA Members. The plan is to move the GDT off the road and back onto the Lost Creek alternate, which needs some maintenance including brushing, deadfall removal and tread repairs, before it can be re-opened. Continue restoration of Trapper Creek Trail towards Maligne Pass. CAMP SET-UP: Group campsite in Jasper National Park. Volunteers must bring all personal camping equipment. REQUIREMENTS: Trail building experience is not required, but volunteers should have some experience camping and hiking. 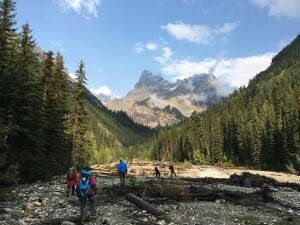 The David Thompson Heritage Trail is an important connection for the GDT between Yoho and Banff National Parks, but hadn’t been maintained in almost two decades. Last year, the GDTA restored 8 km of trail from Cairnes Creek to Lambe Creek in this spectacular Blaeberry Valley northeast of Golden BC. We will return next summer to remove brush and deadfall and re-establish the trail tread all the way to Howse Pass at the Banff National Park boundary. For this trip, no motorized support will be available. Volunteers will backpack 8 km with tools and their camping gear to establish a base camp for 4 nights at the base of scenic Lambe Creek canyon waterfall. We’ll end the summer with a blast! MINIMAL CAMP SET-UP: Primitive backcountry camping. Volunteers must bring all personal camping equipment. REQUIREMENTS: Trail building experience is not required, but volunteers must have previous backcountry hiking and camping experience and a moderate fitness level. The GDTA will provide all trail maintenance tools, tool training and safety orientation for all trips. See our Volunteer Guide for more information including descriptions of our various Trip Models. We hope you’ll join us in 2019 to experience all that you have come to expect from GDTA trips: scenic views, camaraderie, fantastic backcountry experience, a glimpse of the Milky Way, a rewarding sense of accomplishment, and so much more! Contact us if you are interested in participating in one of our 2019 GDTA Trail Building & Maintenance Trips and remember that you must be a GDTA Member.